For the past several days, I have been trying to use WSUS Offline Update to download the latest patches for 64-bit Windows 7, 64-bit Windows 10, and Office 2016. I have tried it, from scratch, on several computers. Every attempt has failed the same way: it gets past a few .NET downloads, then fails with "ERROR: Download failure for w61-x64 glb." I have attached the console output (console.txt) along with the download.log. Your problem is known, MS has re-released the .NET Framework 4.7.2 and changed the download URL. WOU doesn't know it yet and fails with a 404 Not found error (the old file is gone from MS servers). If you want to update the URL by yourself, please refer to this post: viewtopic.php?p=26321#p26321. I am also seeing this error, but with Windows 10, with the most recent version of this program (28.05.2018 Version 11.4). I attached a screenshot to show what I'm seeing. I tried the previous version of this and it downloaded just fine. So I'm pretty sure the problem exists only with the latest version released, and hopefully the next one fixes this problem. It's the same problem as in this thread: viewtopic.php?f=3&t=8217. And also the solution is the same: either wait for WOU's static download link list to be updated or update it yourself. I made the suggested change to \static\StaticDownloadLinks-dotnet.txt, a new run is now downloading the Windows 7 updates. Thanks! How should we know, what the correct links are to fix the StaticDownloadLinks txt files? Do you already know when you will release an updated version of WSUSOffline where this bug is fixed? To be able to help here, we need more information, i.e. full console/CMD output and an excerpt of wsusoffline\log\download.log. You don't need to. Typically WOU's static download link lists are updated automatically from download.wsusoffline.net, but this requires the author to update them. This hasn't happened so far, but I'm quite sure it will eventually. There's no need to do so to fix the issue for existing WSUS Offline "installations", as I explained above. Nonetheless, there will probably be a new release to avoid that WOU comes with outdated static link lists that would have to be updated first. These are exactly the same error messages as shown in the screenshot above, in post viewtopic.php?f=3&t=8220#p26337 . The reason will be the same: The download of .NET Framework 4.7.2 failed. You can see that in the screenshot, if you search for the message "ERROR 404: Not Found" from wget. There are no known problems with the download of Windows 10 updates. The last line "ERROR: Download failure for w100-x64 glb" should be considered a general error message. It is displayed for a number of reasons: Sometimes there are problems with the WSUS catalog file, or with the calculation of superseded updates. The last steps before this error message indicate the real problem. Here, "Downloaded: 4 files, 306M" means, that the script was just downloading updates for the .NET Framework (by comparison with the mentioned post viewtopic.php?f=3&t=8220#p26337 ). 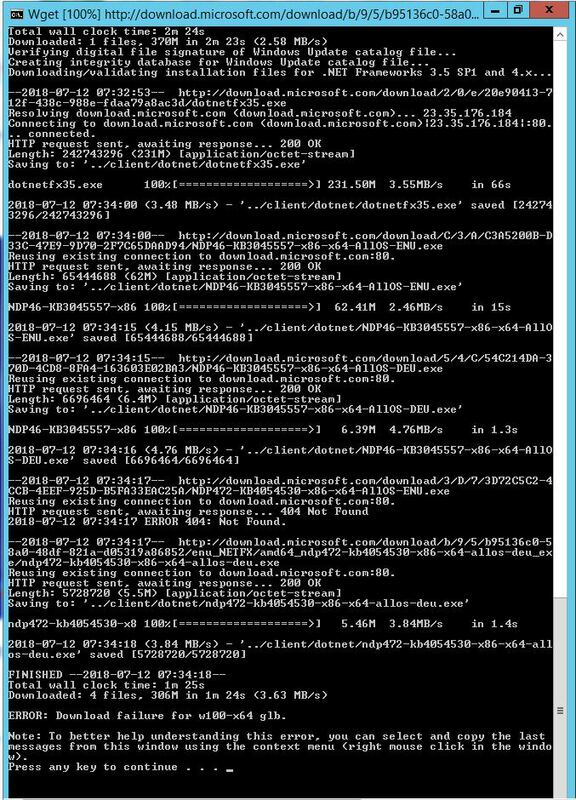 Please delete the content of .\client\md and retry after updating the link in .\static\StaticDownloadLinks-dotnet.txt.